The prosthesis is retained by ball or locator attachments on the gums (in the posterior area), making the dentures more stable and improving chewing function. Sores and discomfort related to wearing a prosthesis are alleviated. 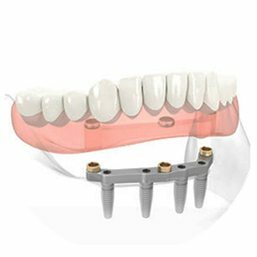 The dentures are held in place with posts in the form of balls and nylon attachments, and show a bone stimulation rate of 70% and stability of 7/10. When the dentures are created with a titanium retention bar supporting the full prosthesis, the bone stimulation rate is 85% and stability is 9/10. 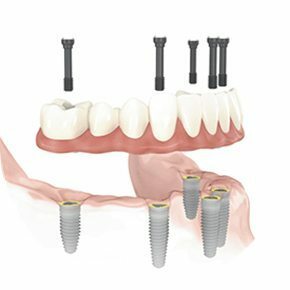 Implants are connected to the prosthesis with an attachment system in the form of balls inserted in nylon retainer pieces. This system also shows a bone stimulation rate of 85% and stability of 8/10. Removable dentures, with or without a bar, held in place by 6–10 implants: This prosthesis without a palate is held in place by implants made of the same materials previously described. The bone stimulation rate observed with this prosthesis is excellent, at just slightly below 95%. The stability and retention are at a respectable 9/10. 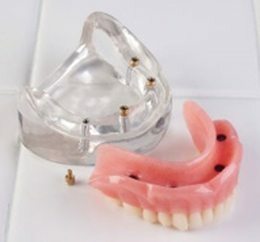 With removable dentures, you still have the possibility of taking out your prosthesis whenever you like. Daily cleaning is made easy. You can keep up the habits you developed with your individual prostheses. 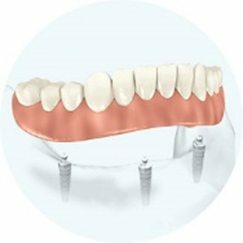 Implant-supported dentures: Precision dentures secured to the gums by implants. This type of denture is considerably more stable and comfortable than other options. Friday from 9:00 a.m to 12:00 p.m.